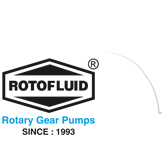 Fluid Tech Systems offer “ROTOFLUID” brand gear pump Model “FT” (Rotary Gear Pumps) which is self priming, foot mounting type positive displacement rotary gear pump. Model “FT” having simple two pieces Cast Iron construction which is single helical modified profile carton steel gear shrink fitted on alloy steel hardened and grind finished shaft as gear firmly supported 4 nos. of self lubricated sintered bronze bush bearing which ensure smooth running. These pumps can be run in either direction with change in inlet-outlet port position. The relief valve operations can be reversed by simply changing the R.V. parts on opposite side. The suction and delivery connections are available in 1/4" to 3" sizes. These pumps can be operated up to pressure of 10 kg/cm² with 5 LPM to 500 LPM flow capacity. 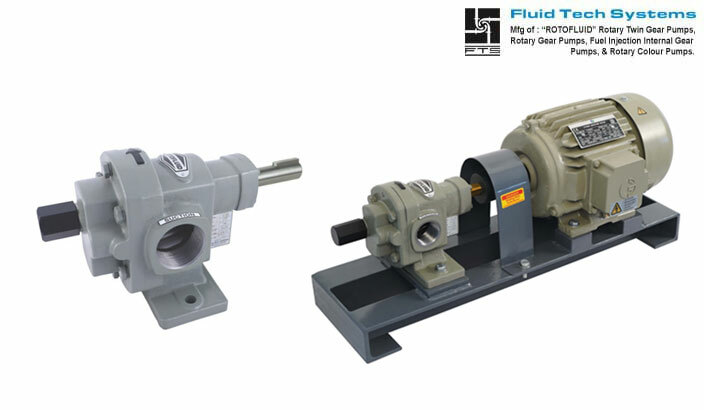 These pumps are designed to run at 1440 RPM up to viscosity of 50,000 to 1,00,000 SSU and maximum temperature up to 200ºc. It is desirable to reduce speed for size above 1½" performance at low speed is always advantageous as it improves efficiency, reduce noise level and enhances operational life. The capacity will reduce in proportion to the speed. Part Material For Standard Material For H.T. All kind of mineral Oils. Fuel oil, Diesel oil, Furnace oil.